Mix one part cigar box guitar with foot stomping beat, add a heaping scoop of blues harp, sprinkle liberally with washboard percussion and top with searing female vocals. Turn up loud, and serve with Whiskey for a good time. “Chains” from our full length release The Budrows. Filmed live at DZ Barber Shop in Hawthorne Ca. as part of the Bonafide Pomade Music Series. “Blood, Guts, and Gasoline” from our full length release The Budrows. Filmed and recorded live at Denver Open Media Studios in Denver CO.
“Pass that Whiskey” from our full length release The Budrows. 11 brand NEW tracks of cigar box rock n’ roll – there is even a tuba on this album…that’s right, a TUBA. Yes, Yes, Yes...I want it! These are four of our favorite cover songs to play, so we thought we should record them for you to listen to as well. Our first album of 100% footstompin’ cigar box rock n’ roll. All Original songs – We did this record in about 8 hours, almost all 1 takes with a couple of exceptions. We want the sound to reflect how we play and sound live, so no crazy studio trickery here, just straight forward, 100% footstompin’ cigar box rock n’ roll. Enjoy. – released July 25, 2011 Credits: Recorded and Mixed by Dave Williams at 2nd Floor Studios, Fountain Valley, CA. Mastered by Burning Token Records, Santa Rosa, CA. The Budrows first started in 2008, when Jason Farthing began building Homemade Cigar Box Guitars. He would hang his guitars at art shows as ‘playable art’, but during these shows, people never understood that the guitars were “actually playable”, so he became a one man band with a cigar box guitar, a kick drum, to show off the bluesy sound of his home-made instruments. Not long after, he and his musical step-daughter, Macarena Rivera, started to write songs together. This quickly progressed into the formation of The Budrows. As a stripped down two-piece band, they played many shows throughout Southern California and recorded a handful of songs for a demo CD. The raw, slide-blues sound of the cigar box guitar, paired well with the driving kick drum and powerful female vocal, but The Budrows were in search of another element. The Harmonica. The Budrows first harmonica player, Jesse Boden, was initially invited to sit in for a few shows to blow some growly licks, but it wasn’t long after that he was a full fledged member of The Budrows. The three went on to record two full length albums and 2 four-song Ep’s before Jesse’s retirement in 2015. A serendipitous meeting led to finding The Budrows newest member and current Harmonica/Flute man, Ron Richard. Ron has been a professional musician for many years, playing with some top dogs in the industry. He came on board and settled in as fast as lightning, learning ALL of the The Budrows 3+ hours of material in a matter of weeks. 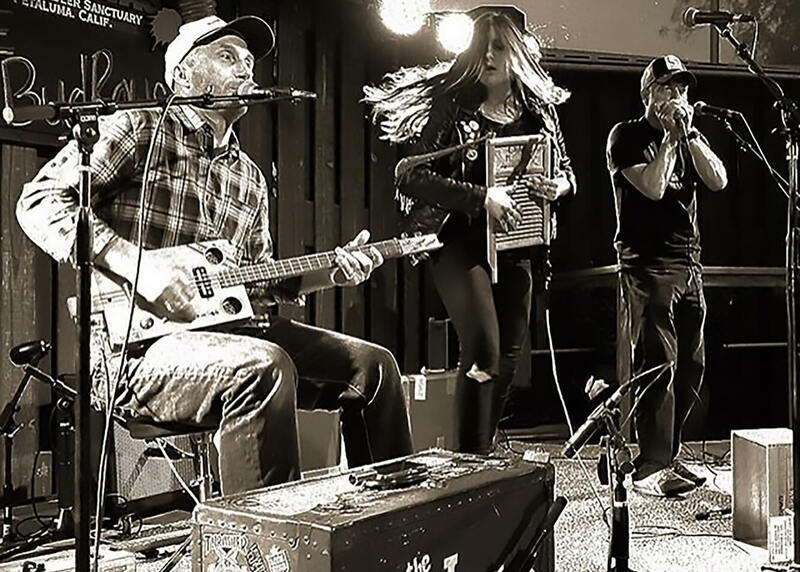 The Budrows are back full strength with the welcome addition of Ron, writing new songs, touring, and constantly expanding their influence of “100% Footstompin’ Cigar Box Rock n’ Roll”. maybe sign us to your label…?